Did you know that Jesus' victory on the cross can also be your victory? Dr. Reagan: The last six verses of Psalm 22 give us a glorious summary of the consequences of the Lord's passion on the cross. The first one is the most important. It is salvation for all who put their faith and trust in Jesus as their Lord and Savior. Here's how verse 26 reads, it says, "The afflicted shall eat and be satisfied; those who seek Him will praise the Lord!" The apostle Peter sums up the meaning of this verse in 1 Peter 2:24. He writes there these words, "He Himself bore our sins in His body on the cross, that we might die to sin and live to righteousness; for by His wounds you were healed." Don McGee: The second blessing of the Cross that is mentioned in Psalm 22 has to do with the obedience of Jesus. It says that His submission to the humiliation of the Cross will result in His glorification before all the nations of the earth when He returns to reign over the world. Here's how the psalmist expresses it, "All the ends of the earth will remember and turn to the Lord, and all the families of the nations will worship before You. For the kingdom is the Lord's, and He rules over the nations." Dr. Reagan: When the Lord's glorious reign begins, all the Redeemed will be prospered, while those who are condemned by their unbelief will bow before Him and confess Him as King of kings and Lord of lords before being consigned to Hell. Verse 29 says, "All the prosperous of the earth will eat and worship, all those who go down to the dust will bow before Him, even he who cannot keep his soul alive." Isaiah puts it this way, "Every knee will bow, every tongue will confess that Jesus Christ is Lord." This is affirmed in the New Testament in Romans 14 and Philippians 2. Don McGee: Think of it, a day will come when Hitler and Stalin will bow and confess the lordship of Jesus, as will Madeline Murray O'Hare, Charles Darwin, and ever other nefarious person who has ever lived. But, it will have no impact upon their eternal destiny. Only those that make the confession in this life will receive the blessing of having their hearts live forever. Dr. Reagan: The psalm concludes with two verses. Verse 30 reads, "Posterity will serve Him; it will be told of the Lord to the coming generation. They will come and will declare His righteousness to a people who will be born, that He has performed it." Notice again the last phrase of Psalm 22, "He has performed it." In the Hebrew, it literally says, "It is finished." This fact has prompted some scholars to theorize that as Jesus hung on the Cross, He quite likely quoted all of Psalm 22, beginning with the words, "My God, My God, why have You forsaken Me?" And, ending with the words, "It is finished." The witnesses then simply wrote down the opening and closing words, which were recorded in the Gospels. Dr. Reagan: As we conclude our consideration of Psalm 22, one thing is certain — the fulfillment of all the prophecies of Psalm 22 in the life of Jesus confirms Him to have been the promised Messiah. This fact raises a crucial question — the most important question of your life: "Who is Jesus to you?" 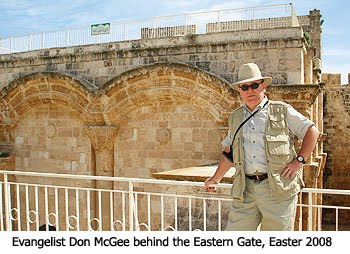 Don McGee: When Jesus was tried by the Roman authorities, the Roman Governor Pontius Pilate asked the assembled mob, "What shall I do with this Jesus who is called the Messiah?" My friends, that is the most important question in the whole universe. So, let me put Pilate's question to you. "What will you do with Jesus?" Will you accept Him as Lord and Savior, as did the thief on the cross? If so, then you will have received the same promise as did the thief. Jesus said to him: "You shall be with Me in Paradise." Dr. Reagan: Or, will you simply wash your hands of Jesus, as did Pilate? If so, then your destiny will be one of eternal separation from God in Hell. Your eternal destiny — Heaven or Hell — depends upon your answer to one question, "Who do you say that Jesus is?" Don McGee: The Bible says that every person on planet earth is under either the wrath of God or the grace of God, because those are the two ways in which God deals with sin. Are you under wrath or grace? You can move from wrath to grace by putting your faith in Jesus as your Lord and Savior. Do it today. Don't delay! For more on the message of Psalm 22, please see my article entitled "The Passion in Prophecy". EI aka Wary - cus I am - exceedingly! So, some related questions are, "Why have you and I been co-crucified and resurrected with Jesus? What part of us was killed off and created anew--our body, soul, or spirit? What did this crucifixion and resurrection accomplish for us?"